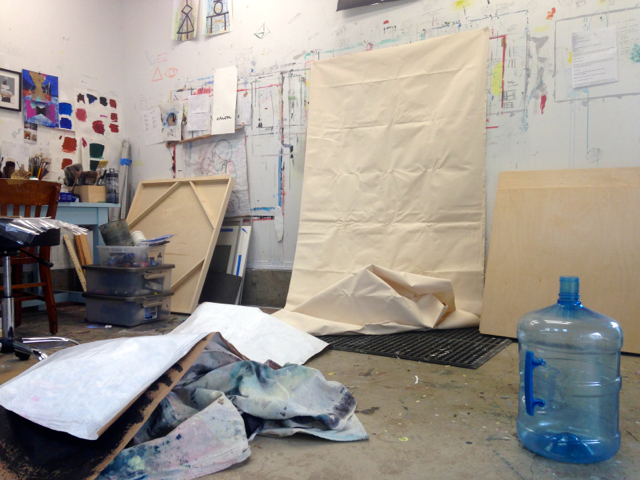 It's late October and I'm resuming my studio practice after some time traveling in September and earlier this month. I am noticing some new ideas "materializing." The material of canvas is new for me. I have painted on canvas in the past but not in a long while. After thinking about it for months I finally purchased some raw canvas. Hanging it up on the empty wall is bringing me much joy. I love the folds and the texture and the color. You may also notice my crumpled and painted kraft paper on the floor. I am ready to start cutting more shapes out of paper as I continue with exploring my visual vocabulary. Here are four pieces I began in late August after a visit to Arizona. I had arrived home with these ideas about space and sky, grubby layers of "ore-elements-geology-earth-sediment" and a palette in my head of oranges, blacks and tans. I wrote about veins of turquoise, starry skies, white veils of clouds and pools of water. I jumped right in and started these paintings and then left them alone for more than a few weeks. Now in Portland the leaves have turned vivid shades of orange and red and we have had a string of perfectly sunny days. I just put these four paintings up on the wall of my studio and they surprised me with their uniformity (as if they are all one piece). They remind me of the ocean and of rusty freight liners- much more aqueous than the desert where from which they were born. They are in an in-between state like the season. I will confront each one separately over the next week or so and see what happens. Thanks for reading. You can see what's new in my studio and daily practices pretty regularly on Instagram. If you want to get in touch send me a message.